The pupils from Ms. Brocklebank's class and Mr. O'Dwyer's class received a visit from two engineers from Jacobs, Katie and Conor. They taught us about the many types of engineers who solve problems in our society to make people's lives better. Katie works as a road engineer while Conor is a process engineer working in pharmaceuticals. After an enjoyable presentation, the pupils were set engineering tasks. The pupils from 3rd and 4th class designed and built mobile phone masts with spaghetti and marshmallows. 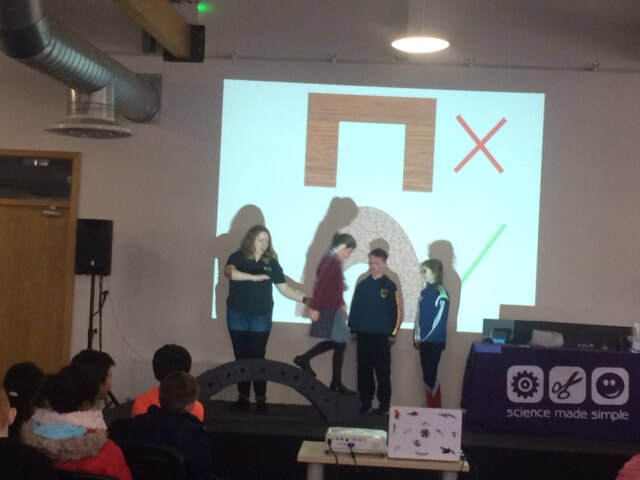 The 5th and 6th class pupils built bridges for trains using the same materials. It was a very enjoyable and educational experience! All classes are having great fun this week testing their engineering skills. There has been lots of building with K-nex and lego. The younger children tried out their coding skills with "Botley" our coding robot (check out all the photos under the 1st and 2nd class tab). Third and Fourth class visited Tallaght Stadium and were treated to a wonderful show "Do you want to be a super hero?". There they learned all about the amazing work of engineers. See lots of lovely photos on their class page here. Engineers Week 2018 has kicked off at Edmondstown NS in Fifth and Sixth Class! We were delighted to get a loan of eight boxes of K'nex from Blackrock Education Centre to help our learning. Projects included towers, cranes, cars, houses (with garages!) and catapults. Pupils learned how best to strengthen their structures and they collaborated to share ideas and skills. 5th and 6th Class pupils took part in the Great Egg Race once more! Working individually or in pairs, pupils were challenged to design a vehicle to safely transport an egg (unboiled) across four desks. As ever, I was blown away by the imagination, ingenuity and sheer hard work that all the pupils put into their creations. Working as engineers, we learned about the importance of planning and sketching our designs, testing our racers and finally reviewing our work. A cracking day with eggs-cellent fun for everyone involved!